As you know, churches have been around for centuries and have been one of the foundations of the world we are now in. While others prefer to visit famous tourist spots, others prefer to visit various churches when they travel. Although some churches are famous for their intricate paintings and architecture like the famous Michelangelo painting in the Sistine Chapel, some are famous for their longevity. In relation to this, most churches sell beautiful postcards to visitors to give them tangible memorabilia that they can either send to loved ones or keep in their memory box. 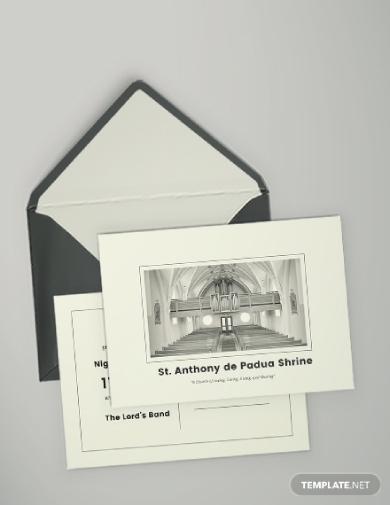 Aside from being a keepsake, a postcard can also be used to tell patrons and interested guests about an event the church will hold. Much like an invitation, it contains details about the event like the name of the event, date, time venue, and so on. 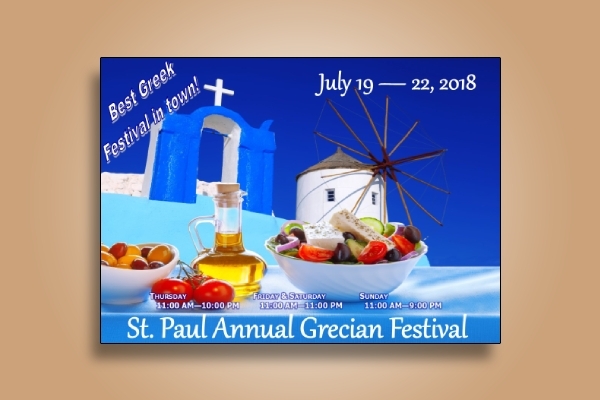 If you are looking for a template for this, you can download this well-made church event postcard template and easily edit its contents to incorporate yours. 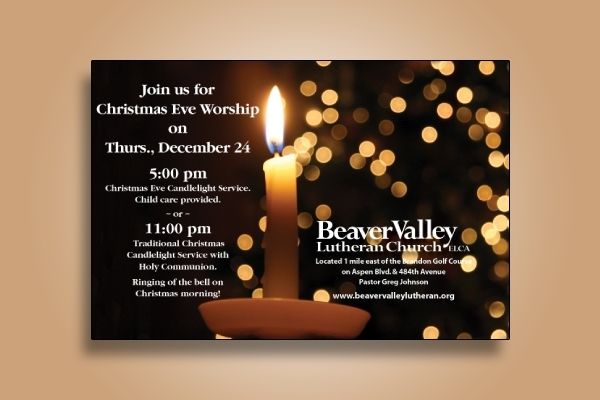 Invite friends, families, and others to your church with the use of this church postcard invitation template. This template features good-quality designs, original artwork and illustrations, flexible layout, and captivating fonts. You can surely use this to invite people to attend a gathering, event, etc. at your church. Download this template from this article and make use of its amazing features. Let the word of the Lord spread on land through the teachings of your church. But that can only be achieved if you have successfully expanded the reach of your church. With that in mind, you need to broadcast your teachings and ministry to the people to entice them to join your congregation. 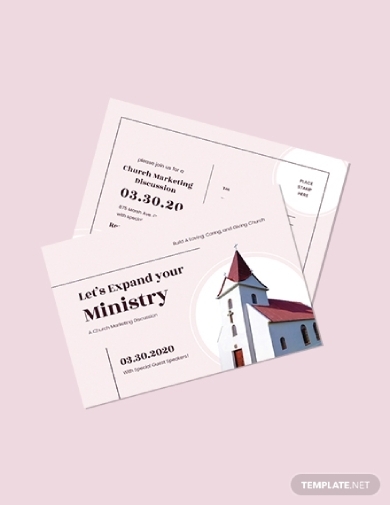 To help you with that, you can download and use this church marketing postcard template to spread the details about your church. After your guests have visited your church, letting them know that you value their time with you is important. You have to remind them your church can be their home and refuge. 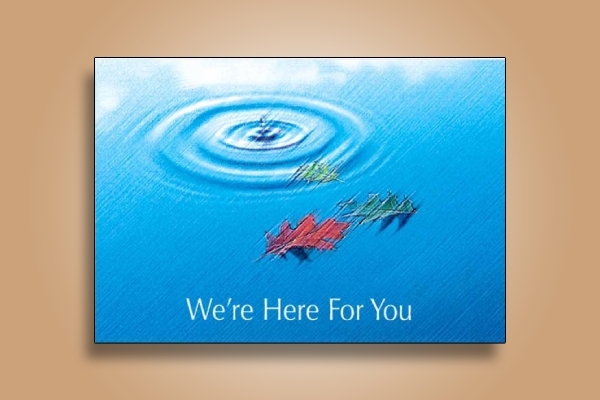 And you can reinforce this commitment to them with the use of a well-designed church postcard. 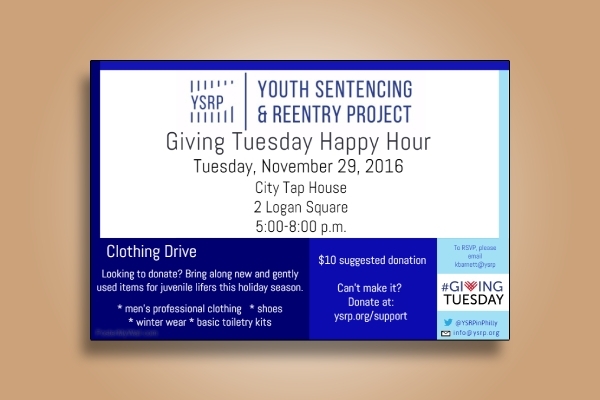 Similar to this example, you can directly let them know that you are thinking of them through the design and illustration that you use. While there are some excellent postcards, there are also some that are just plain bad. This example has been deemed to be a bad church postcard because it lies upfront to the people through false advertising. If you are tasked to design and create the postcard invitation for your church, it is important to be clear, direct and honest. If the people find out you lied with the contents of the church invitation, they might resent and badmouth your church as a whole. 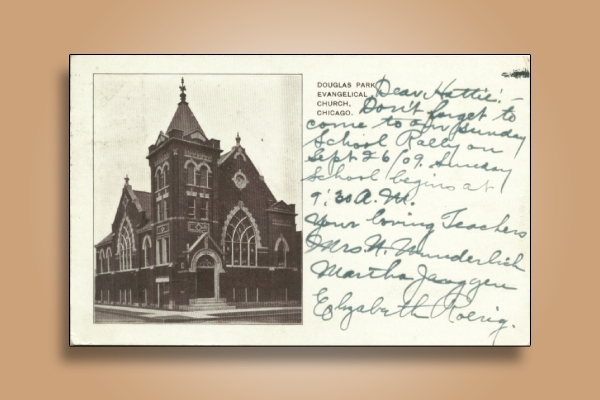 This is an example of a vintage church postcard. As you can see, it has an image of the actual church which is quite a common design element in most vintage church postcards. Aside from that, it has no other designs elements and no front or back designation; it only has an image of the church and a space for writing the message. If you want to achieve a vintage and basic postcard look for your church merch, you can use this example as your guide. 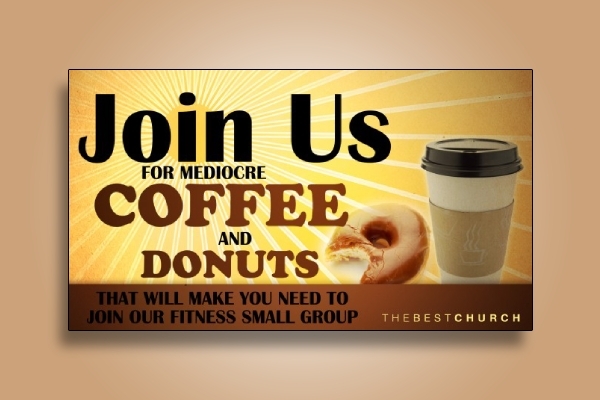 Inviting people to attend an event your church is hosting can be quite tough. But with the help of the right marketing and promotional tools, positive results and feedback can be achieved. 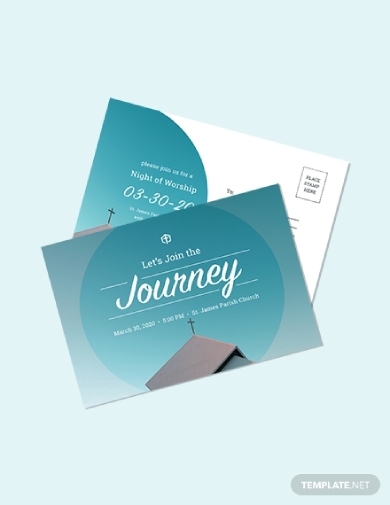 With that in mind, you can take a look at this church postcard invitation example, and you can take inspiration with its design and illustration. You can also use this as a guide to keep you aware of the necessary contents to include. Easter is an important holiday and celebration in the Christian congregations. It is a celebration of the resurrection of Jesus from the dead as described in the New Testament. With that, it is expected that churches will hold big celebrations to commemorate how Jesus has risen from the dead. It is also a time for the believers to show their love, dedication, and gratitude to the blessings the Lord has showered upon them. 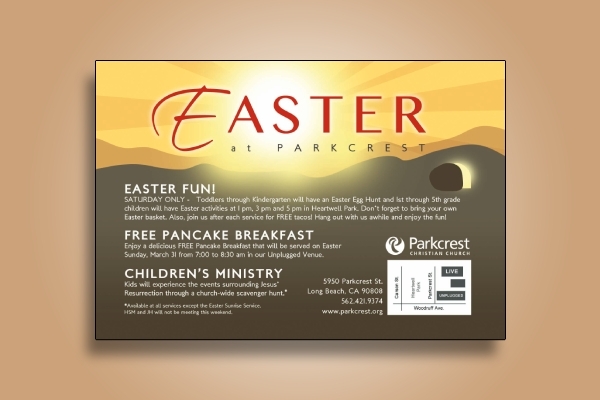 To invite guests, you should distribute a well-made Easter invitation postcard that contains all the necessary details about the event. A special event is celebrated every 25th of December; on the said date, Jesus Christ was born. The word Christmas is the shortened form of “Christ’s mass” which relates to how Christians commemorate it. A mass service is conducted where Christians remember that Jesus died for us and then came back to life. It has also been a cultural celebration that is celebrated everywhere in the world. If you want to invite people from all walks of life in such a wonderful celebration, you can use a Christmas postcard invitation to let them know of all the necessary details. In Roman Catholic, various saints are celebrated for all the sacrifices they have made in the name of faith. Most Catholic churches are also named after their patron saint. That is why there are various celebrations for each church that also follows the teachings of each saint like events that can be a benefit for the whole congregation such as a fundraiser event. 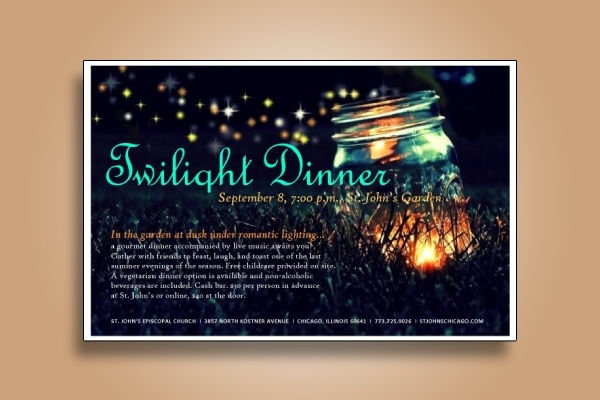 In this regard, if you want a high audience turnout and participation for your church event you should send a comprehensive invitation to the people similar to this church dinner invitation postcard example. As mentioned, the Roman Catholic and other Christian congregations commemorate the canonization of their respective patron saint. Looking at this postcard example, you can clearly see and understand what the celebration is for and when it will be celebrated. Including answers to the 5 Ws and 1 H question in the postcard that serves as your invitation ensures that people know when and where to go to attend the festival.